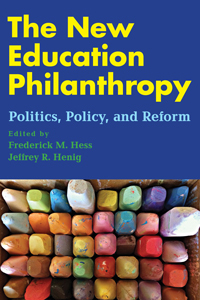 Yesterday, Harvard Education Press officially released The New Education Philanthropy, a volume edited by Rick Hess and Jeff Henig. The book is a follow-up to one Rick edited a decade earlier, With the Best of Intentions. Empirical analysis and constructive criticism of the role of foundations in education is hard to come by. There are few professional rewards and significant risks in trying to analyze foundations and offer suggestions for improvement. Foundations are accustomed to criticism, but much of it comes from people opposed to the idea that foundations should influence the education system, so foundations tend to classify all criticism as hostile and tune it out. Folks not opposed to the mission of foundations tend to want funding from them and so tend to censor themselves when they might have analysis and criticism to offer. In addition, foundations generally limit channels of communication from their friends for fear of being unduly lobbied by them for funding. The ironic result is that foundations seeking to improve learning have virtually no mechanisms for learning about themselves and making their own improvements. They generally don’t want to know. They don’t want to hear the rantings of those who hate them and they don’t want to be influenced by the flattery and manipulations of those who love them. But there is a third type of person that they have difficulty recognizing — someone who wants to help them by offering independent analysis and criticism. This is why books like The New Education Philanthropy and With the Best of Intentions only come along every decade or so. Few foundations will provide any support for independent empirical and critical examination of their efforts and few scholars are willing to engage in this type of work. Even if someone else pays, few foundations are willing to engage in conferences, panel discussions, and written exchanges about their own efforts. They tend to be as defensive and insular as presidential campaigns and are often operated as if that is what they are rather than learning organizations. This is why books like The New Education Philanthropy and With the Best of Intentions are so important. There is much that education philanthropies and others could learn from these volumes. My chapter in the first book, “Buckets into the Sea,” examined the extent of philanthropic activity in education relative to public funding. I found that all private giving to public K-12 schools, from the bake sale to the Gates Foundation, amounted to less than one-third of 1% of annual spending. It’s basically rounding error. A billion dollars feels like a lot of money to you, me, and the folks at foundations, but to a public school system spending over $600 billion annually it is not nearly enough to get them to do things that they don’t already want to do nor enough to purchase things that they can’t already buy. So, foundations lack the resources to purchase education reform through the sheer force of their money. In the chapter I wrote a decade ago, I suggested that if foundations wanted to change the education system they would have to engage in policy change to re-direct how the much larger pool of public resources is spent. Around the same time that my chapter was published in With the Best of Intentions, many large foundations started to change their strategy to focus on policy advocacy. Unfortunately, just as foundations failed to grasp the limitations of their fiscal resources, they also failed to understand how limited their political resources are as well. This prompted my new chapter, “Buckets into Another Sea,” in The New Education Philanthropy. Foundations have enough money to dominate the conversation of a few hundred people engaged in policy research and advocacy, but they don’t have enough resources to achieve enduring policy change without backing policies that generate their own constituency. If expanding school choice creates tens of thousands of beneficiaries who are willing to rally on the steps of the capitol, they can create self-sustaining policy change. But if foundations back policies that generate few natural constituents, then those policies are difficult to get adopted and even harder to keep over time. There are no rallies for using test scores to evaluate teachers. There are no rallies for common standards, assessments, and the “instructional shifts” they require. Whatever the merit of these policies, foundations lack the political resources to achieve them without genuine constituents who will fight for them independent of foundation funding. Check out The New Education Philanthropy and With the Best of Intentions to see what other insights folks have to offer. We may not be right, but an honest and open discussion about effective strategies for foundations is sorely needed. This entry was posted on Wednesday, December 2nd, 2015 at 10:06 am and is filed under Uncategorized. You can follow any responses to this entry through the RSS 2.0 feed. You can leave a response, or trackback from your own site. This analysis is 100% on the money, so to speak. Look forward to reading the new edition. This article in Slate about the Gates climate change initiative makes a related point. People who amass wealth in one industry and become philanthropists rarely understand what other industries need to do to innovate. In the end, reforming/changing K-12 policy and practice requires changes in law. This is true no matter where one is on the spectrum of “change.” If one thinks schools are underfunded then law changes are needed to boost budgets. If one thinks parent choice is the best form of accountability, then law changes are needed. If one thinks “standards” need to be set and made uniform then law changes are needed. Philanthropists seeking real reform/change should schedule meetings with D and R elected officials who sit on legislative education committees. This would allow well-intended donors to appreciate the likely gap between their perception of things and the reality on the ground. Donors would learn how many of their assumptions aren’t even on the radar screen in state capitols. Then they could assess how their philanthropy might be changed in response. This was a really interesting article. I also saw this: http://www.arnoldkling.com/blog/bill-gates-energy-initiative/ . Effective philanthropy is really hard. But it could be a little less hard if philanthropies developed mechanisms to facilitate their own learning and to check group-think, selective-reading of evidence, and other common forms of self-deception. Agreed. How much of the issue is structural? If I had $10b to give away, I’d hire competing teams with sharply differing views, and set myself up as the “Commissioner.” I love hearing intelligent argument, and it’s fun to say “Great, prove it.” I’d create early conditions where to participate, teams had to agree up front on the metrics, so goalposts didn’t get switched…. But is that because I grew up sitting at a dinner table that enjoyed argument itself? (Sometimes too much). By contrast, it feels like each foundation (without exception?) spends time to develop an institutional point of view. As if that’s a needed step! If one agreed with Jay’s point that philanthropy was “really hard,” wouldn’t you logically skip this step (purposefully), and instead operate like a VC, making *competing* bets and savoring NOT having a pre-determined winning horse (until you really did)…. I entirely agree. In fact, I have suggested on several occasions to foundation officials that they should establish Team A,Team B, etc… each able to operate with independent reform strategies. No one seems interested. It should be remembered that philanthropy itself, as we now understand that term, is still in its infancy. Rich people giving money to those in need is of course as old as the hills. But until the modern era this activity was closely associated with the whole political and economic order – the patron/client system of social organization. This meant that the giving was expected to conform to publicly recognized practices and systems. “Philanthropy” in the modern world, as a really private act of giving in which the giver can give to whatever he wants, is something entirely different. And until the 20th century it was almost entirely directed either at direct relief of individual people’s economic needs or to stable public institutions like the arts. “Philanthropy” that originates with the giver’s private judgment of what to give to, but which nonetheless seeks to systematically change public life, dates to the second half of the 20th century and mostly to the fourth quarter. None of that means it’s bad! And none of that means we have any cause for somehow trying to rein it in. It is an indispenable force for good, not to mention one of the few remaining sources of strength for minority viewpoints against an increasingly hubristic tyranny of the small-d democratic majority. But it is in its infancy, and it is only to be expected that the foundations are not yet very much aware of their own inadequacies – such as the ones Jay rightly diagnoses in this post. My hope and expectation is that, just as the foundations of today look back on the wreckage of the Rockefeller and Ford Foundations and cringe, and take tangible steps to avoid their fate, the kind of dysfunctions Jay diagnoses will similarly loom large in the awareness of foundations not long from now, and steps will be taken to redress them. The one thing these people know they don’t want to do is waste their money! Thanks, Greg. I think there are some examples of modern philanthropy going back to the late 19th century, including Julius Rosenwald supporting the opening of schools for African-American children throughout the South, Carnegie fueling the construction of public libraries, and JD Rockefeller, Stanford, and Vanderbilt building new, scientifically-oriented universities to reform higher ed. But the point still holds. Using Philanthropy to change society is relatively new, is very difficult, and many mistakes will be made by earnest, smart, and hard-working people trying to do this. Fair enough – I guess it depends on how out of sync with existing structures the change has to be to fit my model.